Dimensioni di questa anteprima: 800 × 533 pixel. Altre risoluzioni: 320 × 213 pixel | 640 × 427 pixel | 1 024 × 683 pixel | 1 280 × 853 pixel | 2 204 × 1 469 pixel. 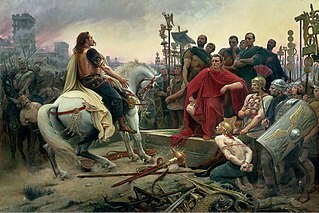 label QS:Lfr,"Vercingetorix jette ses armes aux pieds de Jules César"
label QS:Lde,"Vercingetorix wirft seine Waffen zu Füßen Julius Caesar"
label QS:Len,"Vercingetorix throws down his arms at the feet of Julius Caesar"
label QS:Les,"Vercingétorix arroja sus armas a los pies de Julio César"
label QS:Lnl,"Vercingetorix gooit zijn wapens neer aan de voeten van Julius Caesar"
The painting depicts the surrender of the Gallic chieftain after the Battle of Alesia (52 BC). The depiction of Gauls with long hair and mustaches is also called into question today. The horse is a Percheron, although at this time this breed was not in Gaul. The rectangular shield also does not accord with the time when they were mostly oval. Musée CROZATIER du Puy-en-Velay. — http://www.mairie-le-puy-en-velay.fr.